Joseph Connolly’s comic novels are always written as interior monologue, a writing technique he recently told the Guardian “just falls out of me… I sort of become the person when I am writing in their voice.” So how does he live from day to day deep within his writing chamber? At home, in Hampstead. I don’t really travel very much. I do all of my writing at home – I have never written fiction anywhere else, and sometimes do wonder whether, if I did, its nature might be affected, for good or ill. As to when – mornings, and some afternoons. I continue until I feel myself straining: no point after that. What is your pre-writing ritual? I have a large cup of strong black freshly-ground coffee, and I do The Times cryptic crossword. And then I begin. Full-time in the sense that I am a full-time professional writer with no other job (in theory; but there are always other jobs). But part-time in that there must be time for reading, leisure and eating out (I do a weekly restaurant review). I write everything with a pen, including journalism. Then I amend it until it looks a horrible mess, when I transfer it to the screen, and re-edit it there. Even in the days of typewriters, I could never create on a keyboard. How do you relax when writing? I never want to relax when actually writing: one has to be in a state of high alert, and total absorption. Afterwards, however, is something else. Mind-numbing shoot-em-up films are good. Wine is good. My readership. I have no time for authors who say “I write for myself.” People are spending their precious leisure time and leisure money on you: there is a duty to entertain, and be thought-provoking. Having said that, I always write what I want and need to: I have never ‘tailored’ anything for a particular market. Who do you share a work in progress with? Absolutely no one. I never read out bits, show bits… or even talk about it. It has to remain within. The first person to see a completed novel is my agent, and then my editor. Which literary character do you wish you had created? I am at one with Iris Murdoch in wishing I had created any character that people could actually name. Dickens managed dozens. I wouldn’t have minded having come up with James Bond. Or Jeeves. But on balance, I think I’ll happily settle for Sherlock Holmes. When I am writing a novel (which is usually) I can’t read fiction. So… the first volume of Mark Lewisohn’s monumental and definitive biography of The Beatles – of whom (obviously) I am a devotee. There is not so much a bedside table as a waist-high double pile of books. Apart from the next non-fiction, there are always anthologies – the new Oxford book of humorous quotations is currently favourite. I suppose Proust: I have only dabbled with it. Some people say it’s magnificent, others that it is full of long and boring bits: maybe what puts me off. And I should probably give Trollope another go: I didn’t get on with him before. In the 1970s, I was collecting first editions of all the 1950s and 1960s novels, plays and poetry that I most enjoyed. No one else wanted them – and consequently my first book was called Collecting Modern First Editions. Now, all these authors – Amis, Murdoch, Golding, Pinter, Stoppard, Hughes, Fleming, Powell and many more – are very sought-after. They are my most treasured – not for their monetary value, but because I have fond memories of gathering them, and was seemingly the first to do so. I don’t much. I like English literature: not even too much of a fan of American. So the last was maybe Dostoyevsky. Kiss, Kiss by Roald Dahl: truly good, and very surprising. 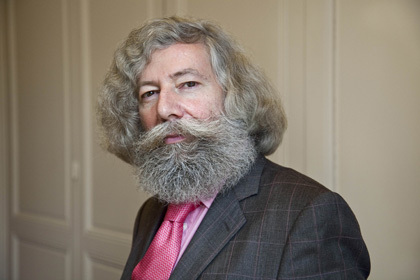 Dominic Sandbrook and David Kynaston on the 1960s… in preparation for a novel I am planning. One wouldn’t want to cram in too many geniuses or brilliant conversationalists, because the result would be babel, envy, hatred and blood on the carpet. But Dickens, I think… Churchill… Muriel Spark… Ebenezer Scrooge… Kingsley Amis… Dorothy Parker… and Bertie Wooster. I once thought I might have been an actor. Or a commercial designer. But speaking of the here and now, if I were not writing… I’d be very bored, frustrated and broke. 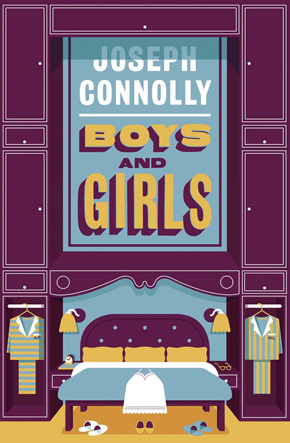 Joseph Connolly is the author of twelve works of non-fiction and twelve novels, most recently Boys and Girls, a tumultuous examination of marriage, male bonding and interminable adolescence, published in hardback and eBook by Quercus. Quercus are also releasing all his backlist novels in striking new editions. Read more.